Metal Potato have been incredibly dedicated to ensuring that our website is the best it can be. In everyday life, appearances matter. In public relations, appearances matter a lot. 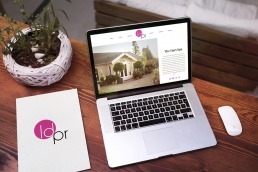 That’s why when Lucy Dartford (LDPR) put out the word for a new website, we were happy to answer the call. The goal? Clean and simple: highlight the positive press their firm puts out for their clients and make sure anyone, on any device, can get the firm’s message. The last part was easy. Thanks to a responsive, mobile-friendly website built on a powerful WordPress platform, the new Lucy Dartford website was built from the ground up to look great on any device. Highlighting their clients’ PR? That needed some more thought. The solution arrived in a mosaic-style “press room” built right into the website. It’s easy to update while events unfold, and it’s gorgeous on any size screen—from a giant, 27″ iMac to a mobile phone. To make sure the firm’s new website gets the most bang for their buck, we included custom Metal Potato copywriting services that is designed to give them a boost with search engines. We also migrated their old website archives over onto the new platform. And, to cap it all off, Lucy Dartford PR opted-in to Potato Care that makes sure their website has daily backups, monthly maintenance and plugin updates, extremely fast customer service response and a dedicated team of spuds ready to handle any update their site should need. It was an absolute pleasure to work with Metal Potato and we are thrilled with the website. They created a website which met our exact requirements and is visually stunning. Metal Potato have been incredibly dedicated to ensuring that our website is the best it can be and I look forward to working with them in the future.